The Home Cinema Choice Awards, sponsored by DTS, took place in London today, and TechRadar was there to catch all the action. Now in its 14th year, the awards created by Home Cinema Choice magazine (owned by TechRadar's publisher Future Publishing) have always been a highlight of the home cinema calendar, and this year was no exception. The big winner on the day was Pioneer, who managed to collect three out of the 20 awards available, including Best TV (40-52in) for its PDP-LX5090, Best Receiver (SC-LX81) and the Reference Status award for its flagship SC-LX90 Susano amplifier and BDP-LX91 Blu-ray player. Other winners on the night included Sony for its BDP-S5000ES Blu-ray player, Panasonic for its TX-37LZD81 television and Freesat. To read more about the Home Cinema Choice Awards, visit www.homecinemachoice.com for its coverage. For more on DTS, the audio specialists, go to www.dts.com. 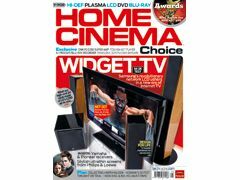 The Home Cinema Choice Awards Special edition magazine is on sale 9 April.